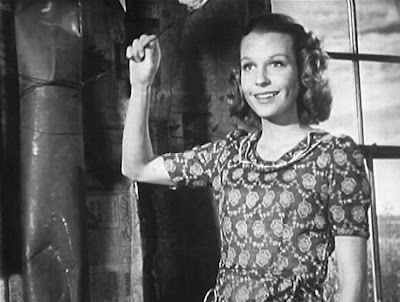 Despite the brilliant artistic success of Jean Renoir’s films of the late 1930s, including La Grande Illusion (1937), La Bête Humaine (1938), an d The Rules of the Game (La Règle du Jeu, 1939), unforeseen events at that time conspired to derail his momentum. 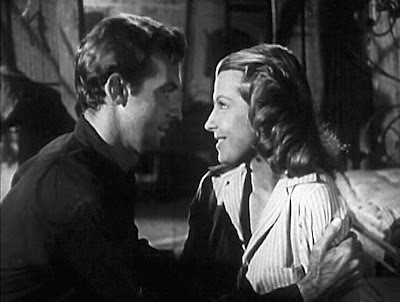 The Rules of the Game was a financial disaster, and the advent of World War II led to Renoir’s migration to the United States in 1941, where he began directing films in Hollywood. There he had to adapt his style to the commercial studio production system of Hollywood, which did not exactly mesh well with Renoir’s improvisational manner of filmmaking and his multi-layered, humanistic aesthetics. 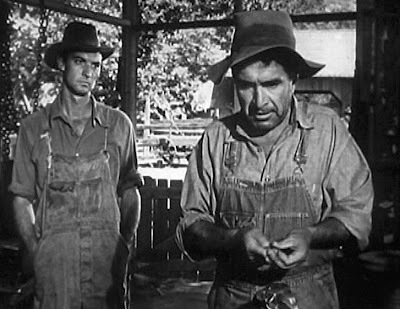 His third feature film in Hollywood, The Southerner (1945), was perhaps his best work during this period in America, and it earned Renoir an Oscar nomination for Best Director. In the case here, things start out with Sam leasing some land that noone else wants, and he then faces the problem of clearing it, planting it, and attending to his family – a wife, two children, and an unbearably querulous grandmother. Upon acquiring the land, Sam learns that the water well on his land is ruined, and he will have to seek water from the unfriendly neighboring farmer, Devers, who turns out to be so churlish and close-fisted that we know he will be a future enemy. Then when winter comes and before Sam has made any returns, he has to try and support his family by hunting and trapping in the semi-barren brush. And then after a winter of eating only meat, his young son comes down with a life-threatening case of pellagra, the necessary treatment of which requires a sufficient diet of milk and vegetables. Again Sam approaches Devers, this time for milk, but is scornfully turned away. This crisis is overcome, though, not by overcoming Devers, but by a providential gift: a local merchant, Harmie, who has been courting Sam’s widowed mother, provides a milk cow for the Tucker family. With Sam and Nona hard at work doing the spring planting, things seem to going well, but the jealous Devers spitefully sabotages the Tucker’s vegetable garden in order to set his neighbors back. With his fists and a little cunning Sam manages to overcome this problem, too, and with a good cotton crop coming in and his mother’s raucous wedding to Harmie taking place, everything finally seems to be joyous. But just then the storm clouds literally appear (signaling the “final crisis”), and a torrential downpour ruinously devastates Sam’s farm and farmhouse. Sam surveys the havoc after all his hard work and is finally ready to throw in the towel and give up. He has finally been defeated. But his humanist instincts prevail when he sees the family cow about to drown in the flood created by the downpour, and he rushes out to rescue it. When he returns home, he sees that Nona is industriously trying to patch things up at the homestead. Sam’s defeatism is turned around by this vision of enthusiastic support, which is the film’s high point, and the story closes on a note of optimism as the Tuckers resolve to continue their venture with their usual optimistic spirits. Overall, the coupling of Renoir’s mise-en-scene and Hollywood’s theatrics work out well, but not everywhere. The background music by Werner Janssen, which I suppose was quite in keeping with the conventions of the time, is obnoxiously intrusive and noisy when encountered today. One feels that it would be better if that ghetto-blaster-of-a-soundtrack could be eliminated entirely (incredibly, this clamorous musical score actually received an Oscar nomination in 1945). In addition there are some awkward character stereotypes that interfere w ith the generally humanistic themes of the story. The character of Granny Tucker, played by Beulah Bondi, is cartoonishly grumpy and annoyingly over-the-top. Presumably she has been installed in the story for comic relief, but she hogs the screen with her rancorous pouting and is just too much of a distraction. Another cardboard character that is exaggerated to histrionics is Devers’ nephew and stooge, Finlay, played by Norman Lloyd. More successful in the comic-relief category, on the other hand, is Percy Kilbride, as the merchant Harmie. 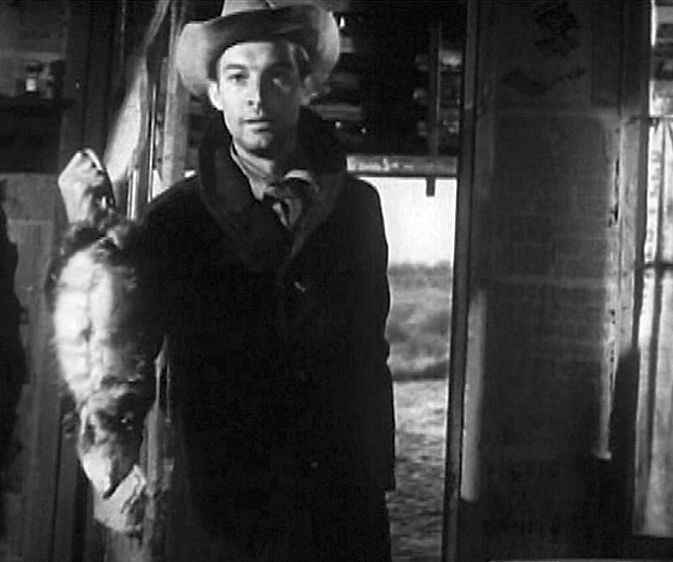 He fits in rather smoothly in the background, more in the manner of Renoir’s character actors in his earlier French classics, such as Grand Illusion. On the upside, it must be said that the performance of J. Carrol Naish, as the mean-spirited neighbor Devers, has a rustic, hard-bitten grit that comes across as earthy and realistic. In just a few strokes, he paints a picture of the unsentimental rural society in which Sam Tucker must operate. Even better are the performances of the two leads, Zachary Scott, as Sam, and Betty Fields, as Nona. Scott was coming off his showy debut performance as the sinister villain in one of the all-time great films noir, The Mask of Dimitrios (1944). Here his native East Texan accent and style made him the perfect choice to play the earnest sharecropper, Sam Tucker. When The Southerner was released there were complaints that the European Renoir didn’t understand the nuances of the American South and that the film was unrealistic. These criticisms were besides the point, because the film was not intended for hard-core realism, and there were larger themes at issue. Nevertheless, Scott’s Texan drawl and emphatic gestures supply a generally convincing tone to the film. Fields’s performance was just as important. An accomplished st age actress who frequently appeared on Broadway, Fields gives the conjugal relationship between Nona and Sam the critical vitality that sustains the overall narrative. The mise-en-scene and camera work does not have the intricate tracking shots that stand out in Renoir’s late-1930s French films, but there are some effective sequences nonetheless. 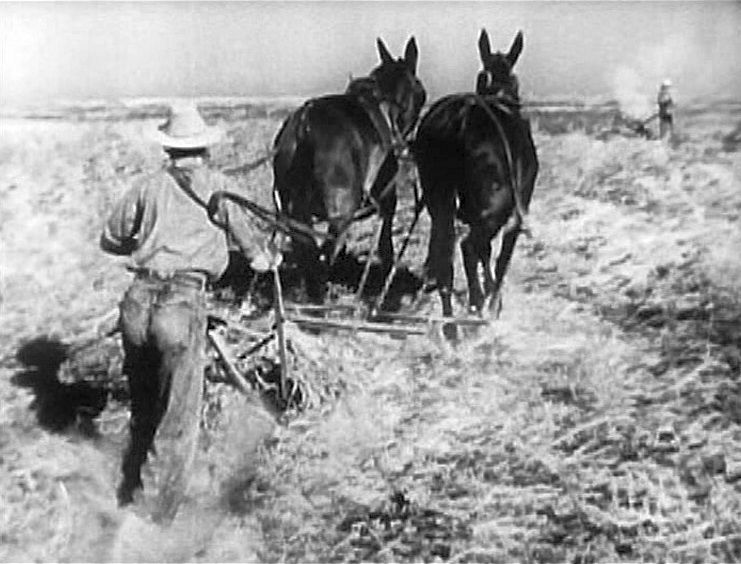 On this occasion Renoir fashions a film featuring considerable atmospheric outdoor landscape footage that contributes to the film’s principal theme of reverence for the land. With his in-depth and well-composed linear tracking shots of the plowing and planting, Renoir effectively evokes the importance of the soil and the earth to the farmers. Sam’s dogged hunt for the possum in the winter is evocatively filmed, and it makes very effective use of edited shot separation to convey what would have been difficult to encompass into unified camera shots. Both the rainstorm sequence and the subsequent desperate search by Sam and his cousin for the family cow through the flooded landscape evoke the degree to which the farmers are always prey to the unpredictable forces of nature. Besides the story following the particular fate of the Tucker family, there are larger themes considered in the film. Renoir, with his European leftist background, would be expected to show sympathy for the plight of the working class, although in this story Sam Tu cker’s quest is actually entrepreneurial: he seeks to be his own boss and achieve some financial success. Nevertheless the film celebrates the rewards that come from working with “your own two hands”. In this connection Sam has a brief philosophical discussion with his cousin about the relative merits and experiences of working in the respective agricultural and industrial economies. On top of all this, of course, there is Renoir’s characteristically nuanced humanism. Everyone in the film is relatively sympathetically viewed and part of a bigger picture: they are all subject to the storms of fate, but they share a common brotherhood in the end. Looking at both the action and relationship threads of the narrative, it becomes evident that the relationship thread is what really makes the film. This is the focus and what the film is all about. Renoir adapted a written story taken from a contemporary novel and fashioned it into a moving love story that is told visually and beyond what words can express. And the telling has a continental European flavor, too. Throughout the story, Sam’s love for his family underlies his struggles to support his family and comfort his wife in times of stress, such as when their boy is ill with “spring sickness” (pellagra). 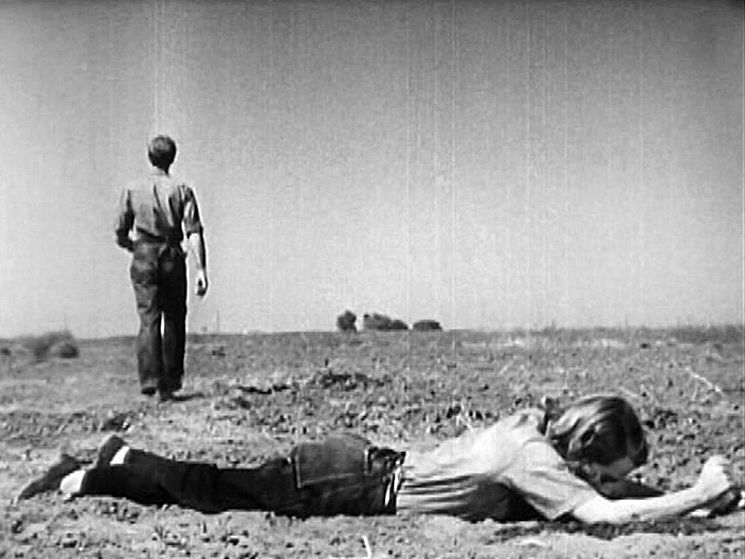 At the same time and despite their hardscrabble existence on the farm, there are numerous indicators and allusions to the fact that the couple has a tender and sensually romantic love life. But it is Sam’s even-tempered, but unwavering, determination and hard work that sustains them all through most of the story. Th en in the end, when he has finally been crushed by the bad luck of a natural disaster, it is his wife, Nona, who gives him the spiritedly loving look that brightens and restores him. That lights him up inside. When you see her cheerful gaze upon Sam’s return to the house, you will be moved by the power of human love. This is Nona’s gift to Sam, and it is Renoir’s gift to the viewers. Don’t miss it. The Writer’s Journey, Mythic Structure for Writers, 2nd Edition (1998), by Christopher Vogler, Michael Wiese Production. Scriptwriting Updated (2001), by Linda Aronson, Allen & Unwin Publishers. The Screenwriter’s Problem Solver (1998), by Syd Field, Bantam-Doubleday-Dell Publishing. I'm watching the film at this moment on TCM (Turner Classic Movies). Ooops! Not anymore - "The End". Regarding the bulleted point about the cow shot following the severe rain sorm, what did the beginning of the item say, as it's missing? I appreciate this critical analysis of the film that you offer, not just a fluffy review where somebody writes how much they "liked" a certain actor and have been their biggest fan since childhood, etc. That bullet point says that both sequences (rainstorm and subsequent search) give the viewer a feeling of just how vulnerable the farmers are to natural forces. Thank you for the update. As an in-law in a family in which there are two farming families that barely survived the last 2 growing seasons in New York USA, I can appreciate that vulnerability. (In 2011, the fields were under 4 to 5 feet of flood water following a hurricane and a tropical storm. In 2012, there was a hurricane AND a drought.) This film certainly gives viewers a taste of that frustrated raging smallness that a farmer feels against the enormity of an unconcerned nature.